Soooo…it looks like we really are simpatico. We all like sweets. Hella cookies. Sugar + brown butter is our jam. Are we still saying ‘jam’ in 2017? This past year has been a crazy ride. Some major highs peppered with a couple of lows. We lost Esther…one of our favorite chickens. Will I ever make peace with the raccoons on my property? No…the answer to that would be no. We had a perfectly mild summer (for us) and my garden went bananas…as did my fruit trees. I did lose two trees over the past year…a plum + willow…and yes, I’m blaming the drought. I went to Taipei for 48 hours. Ate more dumplings than humanly possible. Travelled in and around the Bay Area more times than I can possibly count and thought the same thing every time I left: if real estate wasn’t so insane, I could see us moving there. I stopped selling scones + cookies to the bakery and regained my weekends. Loved early morning baking, but the joys of sleeping in and snuggling with my kids won. I gave in to my need to bake more sweets and was rewarded with you guys digging it. So thanks. Not to sound like I’m standing on the stage accepting my Oscar, but none of what I’m doing would be as meaningful without all of you. Your comments, emails + photos of my recipes give me more feels than I could begin to articulate. Bigger thought: will we still be saying ‘feels’ in the new year? I have some really exciting stuff planned for 2017…that I can’t wait to share. Enjoy this last week of 2016 + I hope you’ll bake some sweets + enjoy time with friends and family. Or alone…sometimes that’s good too. Let’s get our bake on!! I mean, who would have thought a little ol’ pumpkin cookie would be the reigning queen. But here she is, in all of her glory. This is not a crispy cookie…nary a crispy area to be found. It’s soft, chewy, toasty, warm and 25 shades of fall. 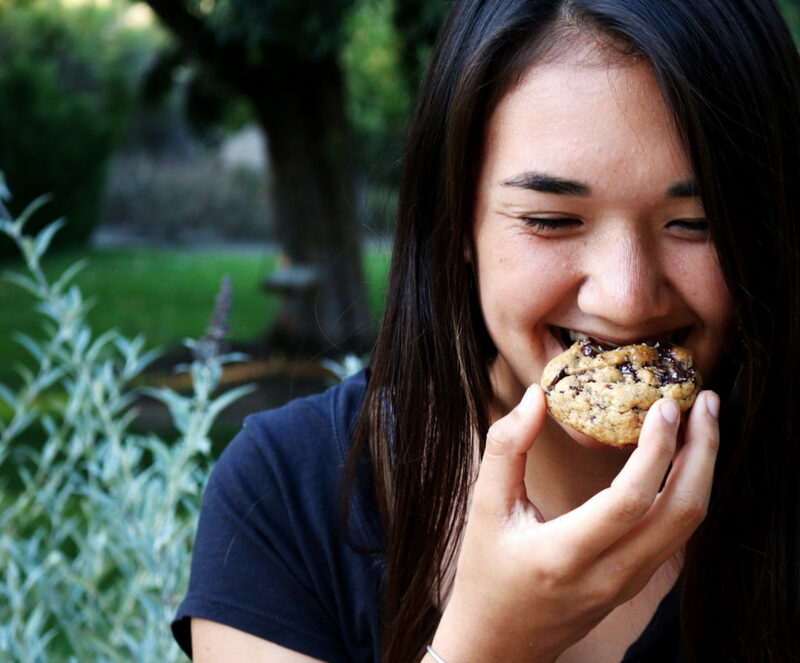 I was so happy-surprised with the love for this cookie…from social media reposts to blog follower remakes. I’ve yet to meet anyone that can resist this pumpkin-chocolate combo. Except, of course, anyone that doesn’t like pumpkin nor chocolate. But then we’re not talking about you…but we still love you. 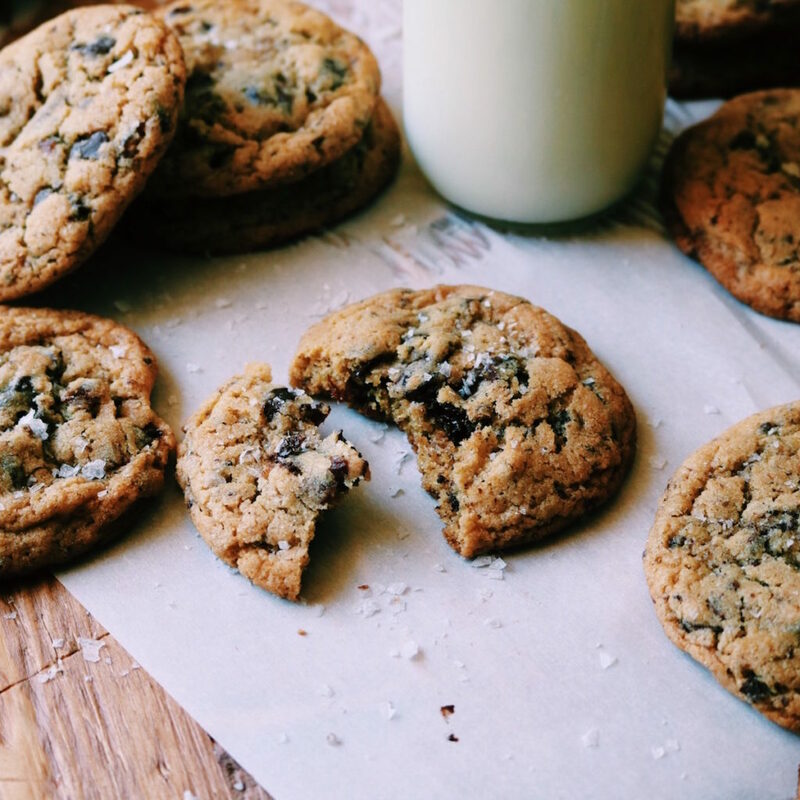 Same as the cookie above…with sugar + brown butter you can’t go wrong. This time, we add mega jazz hands with the addition of muscovado. Which, if I haven’t yet persuaded you to buy some, I hope the time has come. 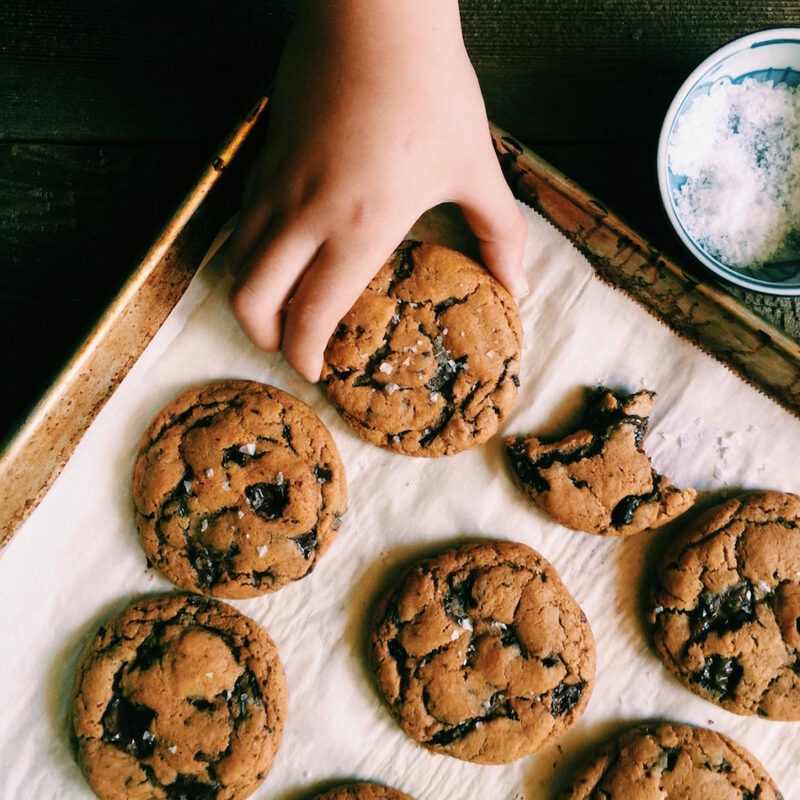 It takes these cookies to the next level. Promise. 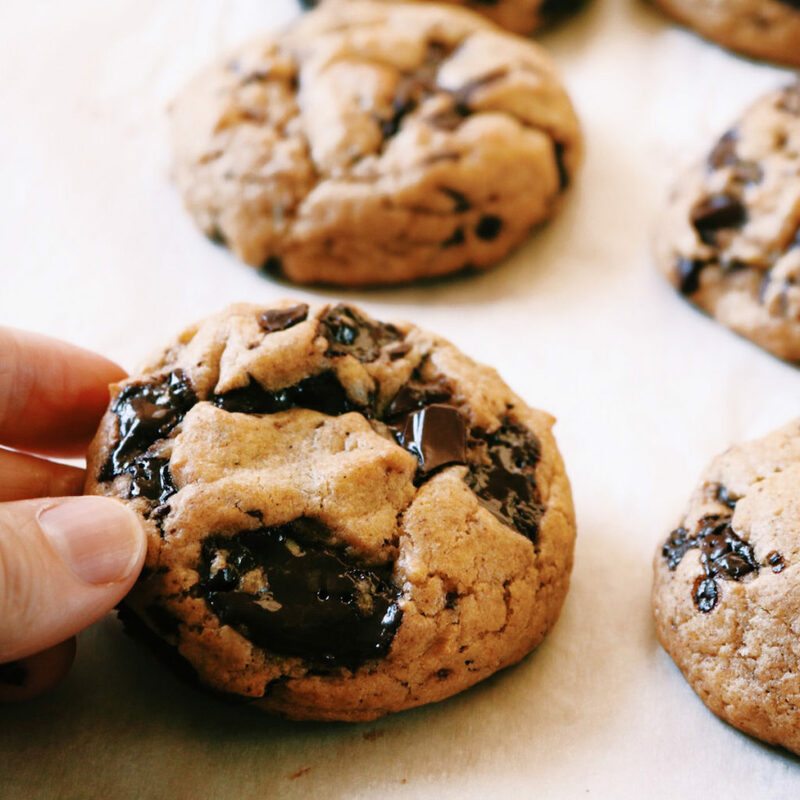 These were created because I loved my gluten-free chocolate chip cookie so much, I wanted a pro-gluten version. I’m working on another chocolate chip cookie for us…so tighten up your girdles and prepare yourselves for the chocolate chip cookie of 2017. Get excited. Oddly, this year more than any other I enjoyed cooking and baking from my yard. My apple trees were prolific…I almost couldn’t keep up. It pains me a wee bit to admit that more than I’d like to reveal are still hanging, frost-bitten on bare limbs. Watch this video from when I made this for the feedfeed’s Instagram Stories. 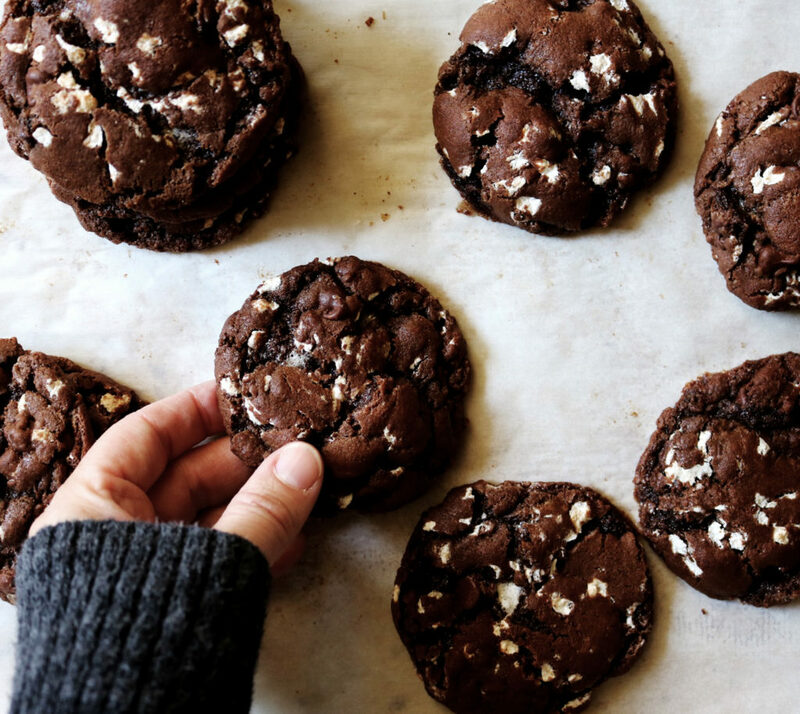 We clearly needed more peppermint-chocolate baked confections in our life. 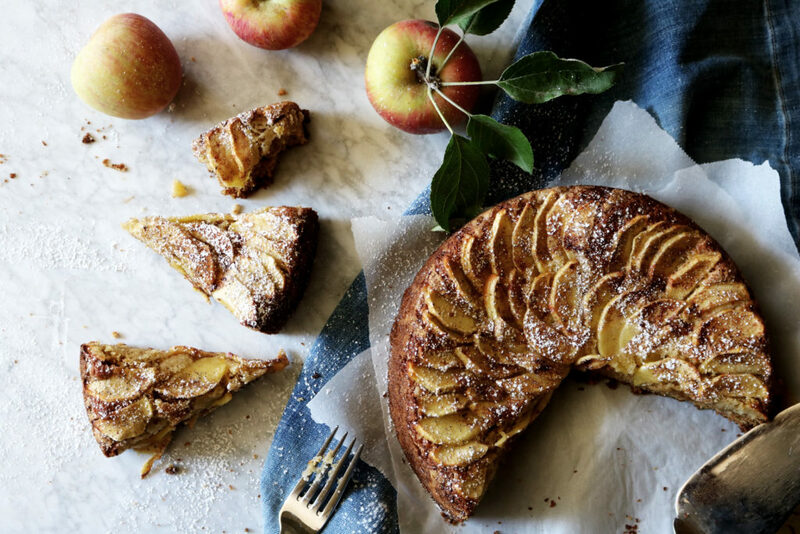 For a just-posted recipe, it did incredibly well in the top ten list. The key to beautiful crinkles is to heavily coat the dough balls in both granulated sugar + powdered sugar, without shaking any of it off. If you have any leftover peppermint bark, this is the cookie to throw it in. P.S. 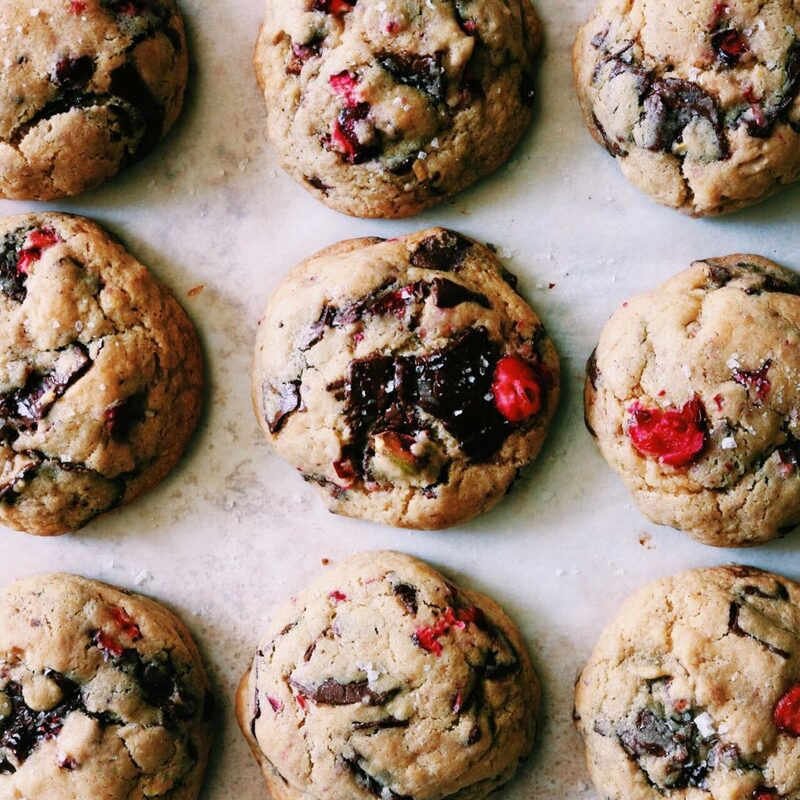 You could de-holiday this cookie by omitting the peppermint extract and swapping in some real vanilla extract. Perfect. 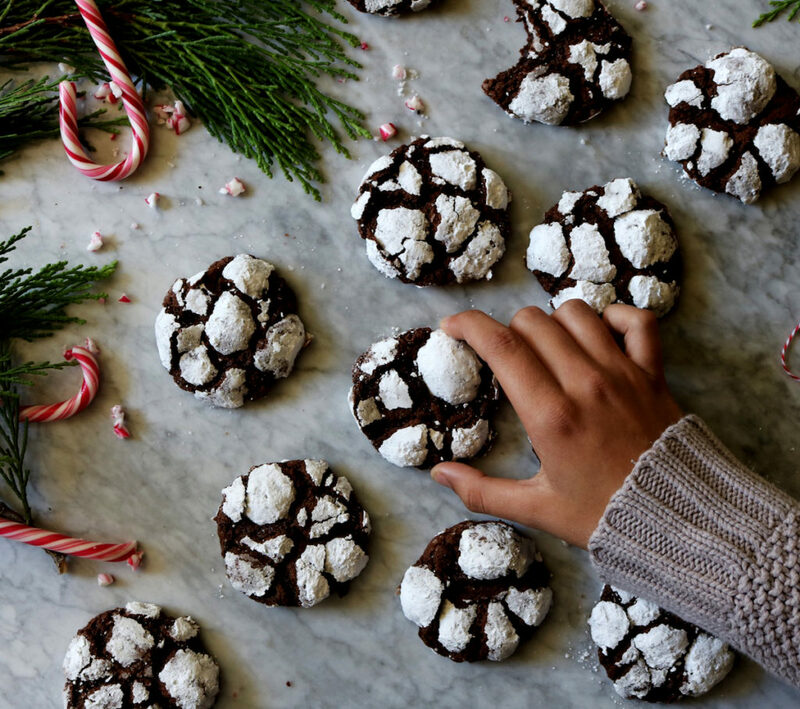 Crinkles for all seasons. I was so excited to get invited to a Williams-Sonoma + Guittard blogger event celebrating the launch of their new baking chocolates…which are fab. The first thing I wanted to do was make a bark and I wanted it to look like the holidays…which pistachios + cranberries do perfectly. A dusting of fresh nutmeg in the dough solidifies this as a holiday cookie. I called it a ‘peace’ cookie because it was right after the election and it was all I could think of…wishing peace for all of us, everywhere, worldwide. 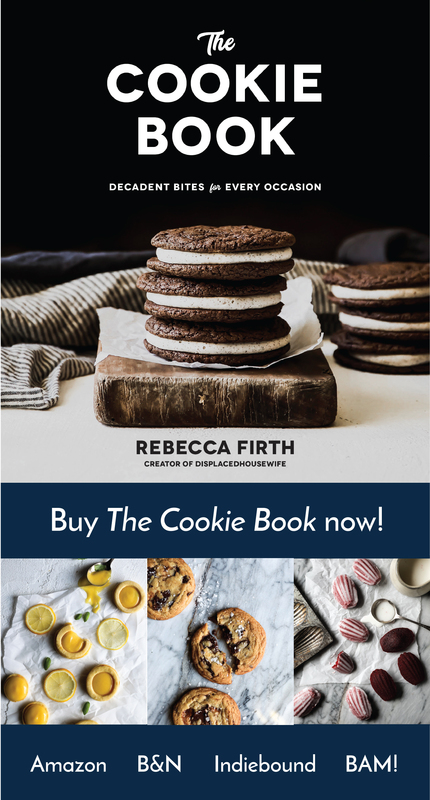 Later, I was thumbing through Dorie Greenspan’s Cookies cookbook and saw her ‘peace cookie’ and felt like a complete hack for naming my cookie the same. So, this is my belated mea culpa. You could easily swap in dried fruit + any nut + omit the nutmeg to make this cookie work any time of the year. Seriously one of my all-time favorite cookies! And one of the only on this list from year’s past. I painfully tested this cookie a zillion times to get it to taste like a pro-gluten cookie, and it does. 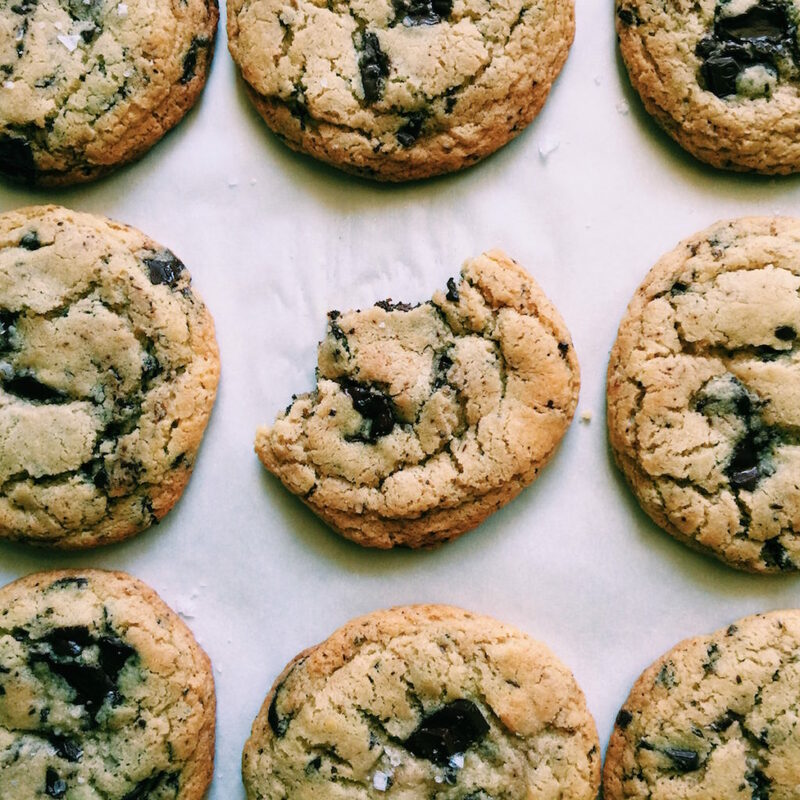 It’s one of our favorite cookies in a house full of gluten lovers. The key is getting good gluten-free flour, chilling your dough, brown butter + adding milk in there. 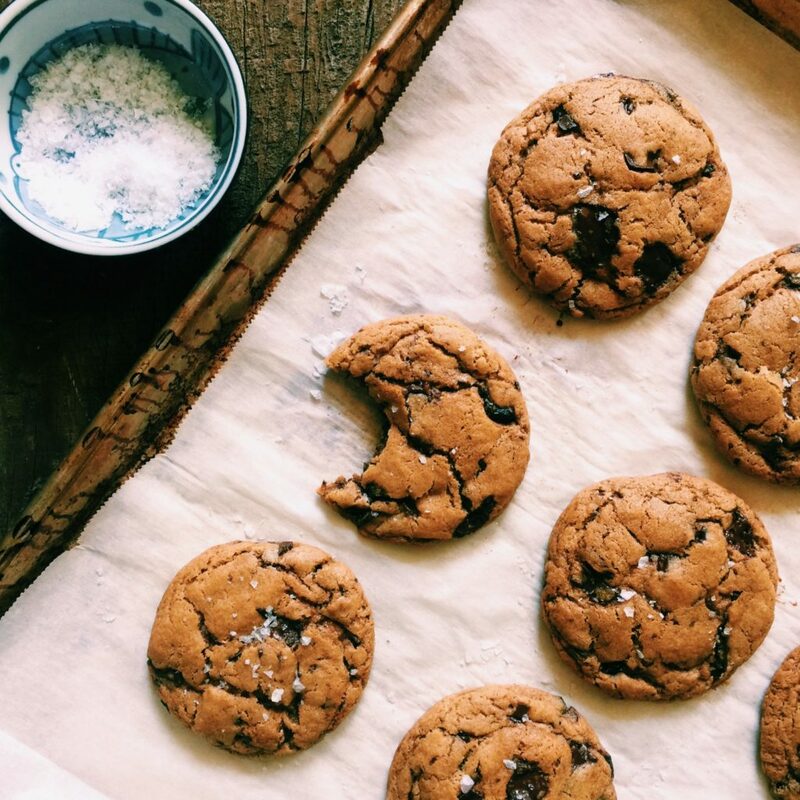 I dream of creating an amazing gluten-free + dairy-free cookie. I think 2017 might be the year. I’m not even going to pretend that brown butter is leaving our lives in the new year. Nope. Not a chance. It’s here to stay. I was seriously obsessed with pumpkin this year. 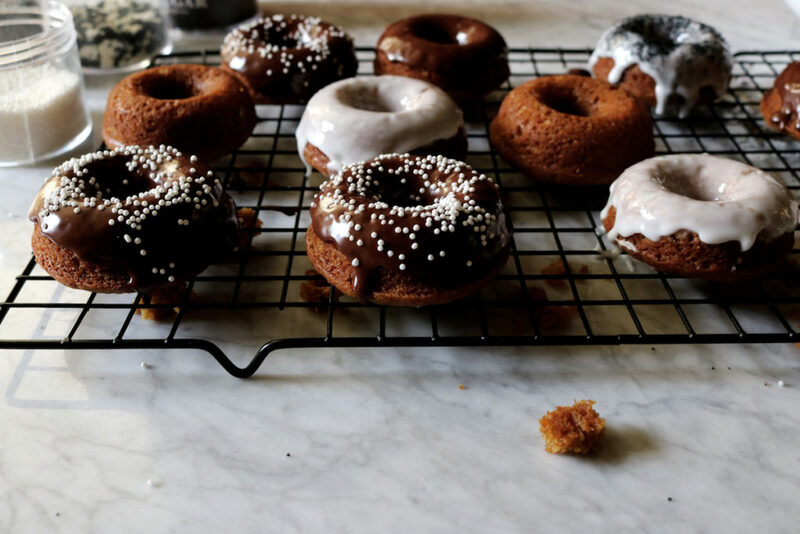 And I used to think that baked donuts weren’t legit…like, not worthy of a post…like, who would want to bake a donut? Besides me? Then I decided to post this recipe because I loved it so much and knew I would want to make them again next fall. And boom. I was proven wrong…you all want to bake donuts as much as I do. I have been unapologetically consumed with shoving marshmallows in everything. I love them. BUT, they are fussy as hell to work with…melting and making things misshapen. We can’t have that. I found these dehydrated marshmallows that hold their shape and bake up beautifully in a cookie. You’re welcome. No really, it was the least I could do. 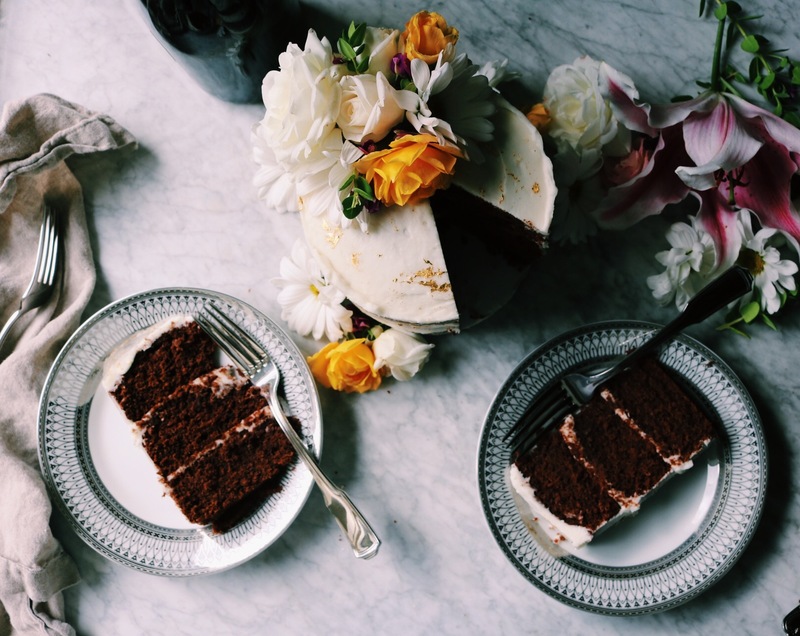 This year my blog actually became a business…companies are actually paying me to create recipes using their products. This was a huge turning point for me. I turn down a lot of companies…if I don’t feel like it’s totally in line with what you and I would actually use in our kitchen, I won’t do the sponsorship. Which is sort of ballsy because like all of you, I have a mortgage to pay and people to feed. But I keep believing that in the end, that will pay off in the long run. Authenticity over all else. Right? 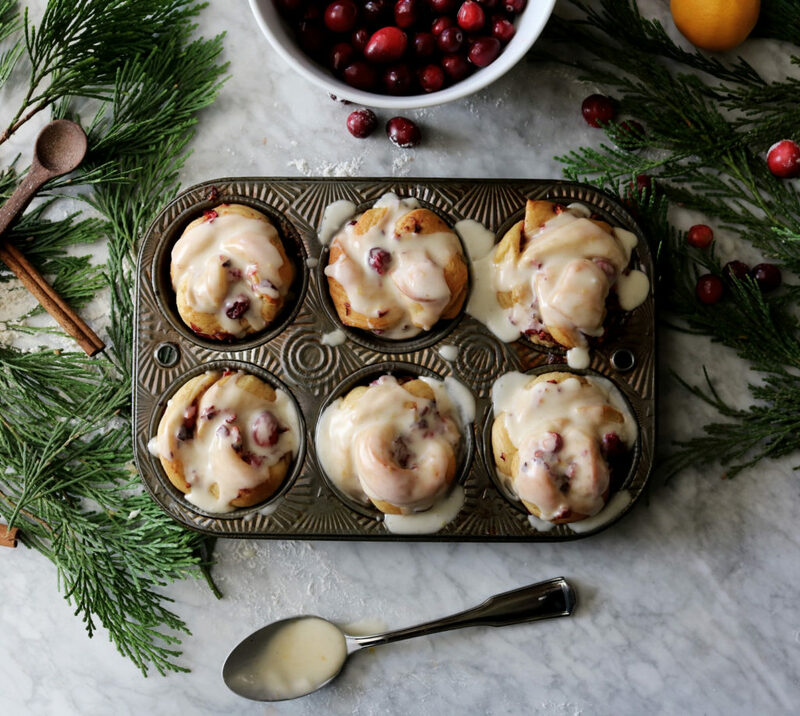 Bob’s Red Mill sponsored this post and I had the best time creating these buns. I just want to say buns 25,000 times. I tested these up the wazoo. I wanted them to be easy….so we get our first rise in the fridge overnight (or for several days) and then we do a quick rise in a cold oven with some boiling water/steam just prior to baking. Suddenly, buns are easy. This I can get behind. Totally blown away by these cookies. I was watching Thalia (Butter & Brioche) make a cookie on Snapchat and I thought: I must have this recipe. I sent her a private message, she emailed me the recipe that inspired her (from another blogger…all of this is on the actual post) and then I ran with it. I futzed with the flours, etc. and came up with this cookie. Perfectly chewy with some exterior crispiness around the edges. LOVE. Sneak a peek at 2015’s Top Ten Reader Favorites here! If you haven’t already watched this SNL of Justin Beiber, please do. In the meantime…this was my New Year’s Eve dinner from the very first year of the blog…so prep yourself for some bad photos…just keeping it real: classic braised short ribs with cheesy sweet potato quinoa. Check it out. Cheesy sweet potato quinoa is beyond. I hope you’re feeling good…taking care of yourself and having a bit of fun. Sending heaps of love + peace!!! Congrats to a great year Rebecca! I love hanging out with you in the blog world and I’m looking forward to lots more time spent together in the future. I hope you and your family have a Happy New Year. That Justin Beiber skit is hysterical! 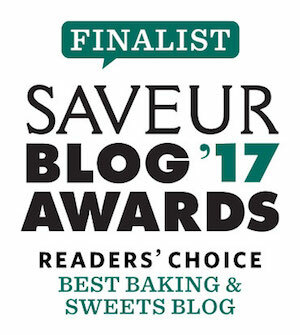 i saw food52’s top 50 recipes of the year recently, and theirs had a hefty amount of desserts as well (and i definitely see my sweet post getting more love than the salad ones, shocking!). hope your holidays have been (and continue to be!) sweet and happy.